The Mars Gamma Ray Spectrometer aboard Mars Odyssey has been able to determine concentrations for potassium (K) and thorium (Th) on the martian surface. 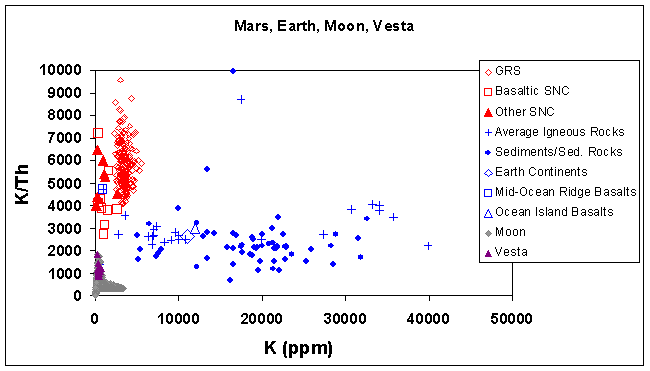 This graph compares the ratio of potassium to thorium (K/Th) detected by GRS (red diamonds) with the same ratio calculated for martian meteorites (red squares and diamonds labeled SNC), the Earth (blue points), the Moon (gray diamonds), and the asteroid 4 Vesta (purple triangles). The K/Th ratio is plotted as a function of potassium concentration. The diagram contains a wealth of information about the surfaces and evolution of these planetary bodies: (1) The K/Th ratios detected by GRS are systematically higher than for martian meteorites, showing that the meteorites do not represent average martian surface materials. (2) Both the martian meteorites and martian surface seen by GRS have distinctly higher K/Th than rocks from Earth, Moon, and Vesta, reflecting a fundamental difference in the amount of the relatively volatile element potassium compared to the less volatile element thorium. 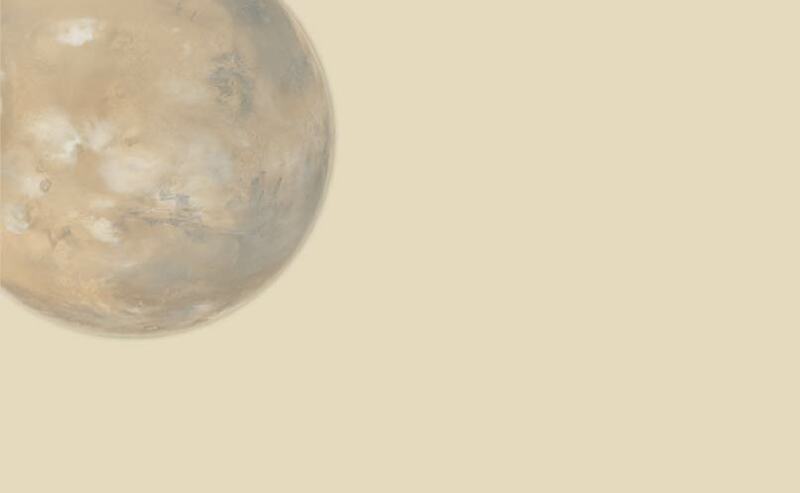 Mars is richer in volatiles, which is indirect evidence for the planet having had lots of water in the past. (3) Rocks at the surface of the Earth contain much higher potassium concentrations than does the martian surface, despite the fact that the bulk Earth (core, mantle and crust combined) is depleted in potassium compared to the bulk Mars. This observation indicates that the processes that operated to make the terrestrial continents led to a much larger range in compositions than those on Mars, perhaps due to the importance of plate tectonics on Earth. The role of plate tectonics is also shown by the two points with high K/Th. These are rocks whose formation involved migrating water-rich fluids, which tend to dissolve lots of K but not much Th.